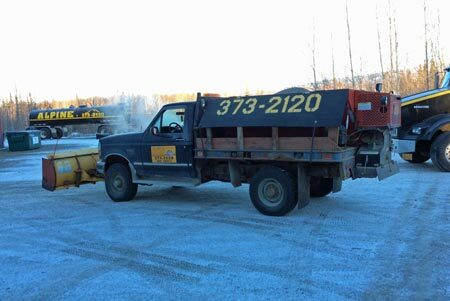 Alpine Septic sanding trucks are out all during the winter to service our customers. Call us a call to schedule sanding your commercial or residential parking lot or driveway. Sanding your driveway can give you the added peace of mind that you have provided an extra measure of safety to your customers and loved ones. In Alaska ice poses one of the worst liability factors to local homeowners and business owners. A good sanding can be one of the best ways to create safety for family, friends, and customers. Icy parking lots are also high on the insurance companies list of liabilities for your home or business. Sanding helps stop accidents by giving cars more traction and stability. Our sanding service can be scheduled to happen as needed throughout the winter to give you peace of mind.